The manufacturer of the EpiPen auto-injector is adding the United States to a list of countries where the device is being recalled. The manufacturer, Mylan, said a defective part may keep the injector from working properly. In the United States, the recall applies to 13 lots of both EpiPen and EpiPen Jr. auto-injectors distributed between December 17, 2015, and July 1, 2016. Patients can receive another EpiPen or an authorized generic version at their pharmacy, Mylan said. In the meantime, they should continue to carry and use their current EpiPen until they acquire a replacement. If you think you may be affected by this recall, you should first contact Stericycle at 877-650-3494. Stericycle’s hours of operation are Monday-Friday 8 a.m.-10 p.m. ET, and Saturday and Sunday 8 a.m.-5 p.m. ET. Stericycle will ask you questions about your EpiPen 2-Pak or EpiPen Jr 2-Pak cartons to confirm if the devices come from one of the recalled lots. You can do this yourself by checking whether the lot number matches any of the lot numbers listed in the table above. If not, your EpiPen product is not affected by the recall and there is no further action necessary. If you are affected, Stericycle will provide you with voucher information to get a free replacement. Mylan reminds consumers that they shouldn't try to return their EpiPen before they get the voucher and that they should be sure to continue carrying their EpiPen until they get the replacement. The recall had previously covered Australia, Europe, Japan, and New Zealand and is now being expanded to North and South America. Mylan said it knows of two instances in which the device failed to deliver a dose of epinephrine. Both patients successfully used a backup EpiPen and were not harmed by the problem. An EpiPen prescription always includes two of the devices and patients are supposed to carry them both so that there is a backup available. 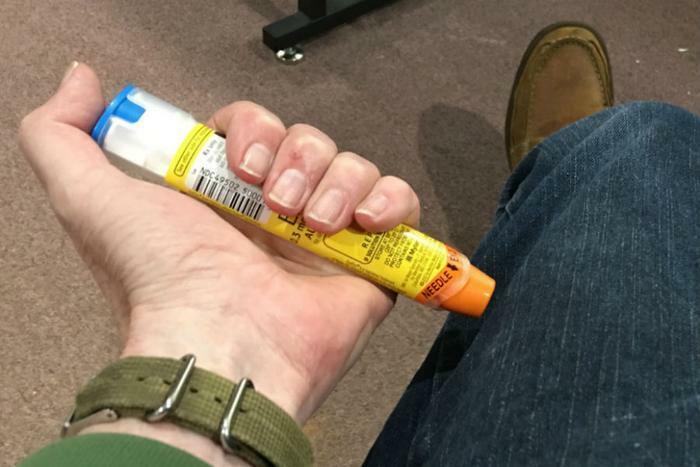 The EpiPen is used to deliver epinephrine to the thigh to help counteract the effect of a severe allergic reaction.